The Cincinnati Bearcats locked down win 10 and improved to 2-0 following a mostly offensively challenged game against the Rutgers Scarlet Knights. The teams struggled early and often getting shots to fall, and actually getting shots. 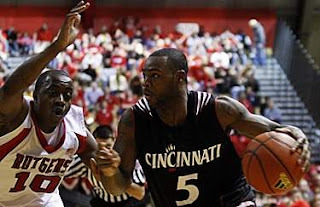 The Bearcat who didn't have that problem was Deonta Vaughn. He followed his 17 point outing against UConn with 17 tonight to lead all scorers. It's great to see Deonta getting it going as the conference season has started. The Bearcats aren't going to do much of anything if 5 isn't leading the efforts. I love Lance Stephenson as much as you if not more, but he can't be Superman every night. Like tonight. Born Ready didn't have a great game his first game back in the New York area. He had a solid game with 10 points, 6 rebounds, 2 assists and 3 steals. He also made the requisite highlight play. With the ball under the basket, he up faked 2 Rutgers defenders, as they came down, he went up and flung the ball at least 2 feet over the rim and it fell perfectly into the net. Great play that not many can do. For the game Scarlet Knights, Jonathan Mitchell lead the way with 14 and 7 rebounds. Mike Rosario had 12 points, all 3 pointers. Dane Miller had a solid 10-6 off the bench as well. The first half of this one was rather dull. Neither team shot well. At one point, Rutgers was 6-26. Despite that, they only trailed by around 5 or 6 seemingly the whole half. That was until the Scarlet Knights caught fire from 3. Mike Rosario missed 8 of his 9, but hit 2 triples in a row, and Rutgers took the lead. Rutgers would add a couple more baskets, and take a 5 point lead into the locker room. The offensive bugaboos that have haunted the Bearcats all year shined in this half. The team turns the ball over too much, and the offensive sets aren't that great. The team tends to stand around and hoist up jump shots. It's frustrating to watch because the talent is there. The discipline is always there on defense, and it really lacks on offense. The Cats are bizarro Notre Dame. The second half was a dog fight for the most part. The Bearcats would grind their way back into the game, pulling to a tie at 41. The team locked down Rosario, who didn't have a basket in the 2nd half. The team also hit the offensive glass and got multiple second chance opportunities, 21 points from 11 offensive rebounds. The Bearcats held the good offensive rebounding Rutgers squad to 7 for the game. The Cats posted a 12 rebound advantage for the game, and it seemed like many of them came in the second half. The action would stay nip tuck until a huge foul turned things. Rashad Bishop was fouled shooting a 3 with the score tied at 51 and made all 3 shots for a third of his total. The Bearcats would not relinquish the advantage. Rutgers big man Hamady Ndiaye got into foul trouble, and the Cats pounded the ball inside to Yancy Gates, 10-8, and Darnell Wilks who played a lot down the stretch and had 6. At least 2 of those were dunks, including one to make it a 5 point game. The lead would stay around 5 coming down the wire, and it was Deonta Vaughn who iced from the free throw line for the victory. They all can't be pretty, but as long as they are wins, they are good in my book. I hit most of the negatives earlier, so I'll highlight some positives. The free throw shooting has boosted the past few games, and did again today with a 14-18 effort. Yancy Gates and Steve Toyloy just aren't getting to the line, and that has a huge impact because they are the worst free throw shooters we have. I love Dion Dixon. No one seems to play harder than him, and he offensive rebounds like a mo fo. 66% of his boards were offensive tonight. I like what I see from Ibrahima Thomas rebounding and on defense, but his offense has a ways to go. He needs to add some muscle. The Bearcats held Rutgers to 37% shooting and 38%, 7-19, behind the arch. The Cats shooting was once again horrible. 41% overall, a terrible 3-16 18.8% from 3. Either the team needs to stop shooting 3s, or they need to practice more. Lance Stephenson especially. His 3 point shooting is horrible. He needs to work on that for the NBA. I would say it's worth staying another year to do that, but the money talks. 6-30 though. Six of thirty! I would like to thank everyone who has come to the site this weekend. The live blog seemed to be a success, and it's something that I'll try again for a big game. I'll look to add more features for you all to enjoy, and don't be afraid to post comments or send emails. Thanks for checking things out. Look for a Pittsburgh preview on Monday afternoon around 2 or so.